"Everybody loses the thing that made them. The brave men stay and watch it happen. Clinging on to the edge of the earth lies a little known, but much beloved piece of world its natives affectionately call, The Bathtub. Nearly submerged underwater in the crevice of the Louisiana bayou, abandoned by the rest of the planet, The Bathtub is home to a large but undervalued number of people who are fiercely attached to their home in a way few can understand. 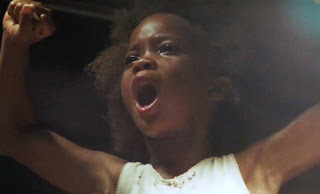 But in director Benh Zeitlin's Beasts of the Southern Wild, one of the smallest inhabitants of the soiled Bathtub bravely stands atop her daddy's makeshift boathouse and attempts to share the story of the entire land, one of which by the end of the film the entire audience will feel a part. 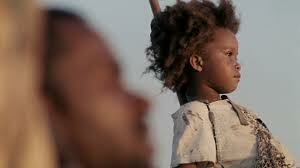 Six-year-old Hushpuppy (Quvenzhané Wallis) is acquainted with being left behind. Her mother left her and her dad, Wink (Dwight Henry), years ago, before their home fell nearly six feet under. The people on the inskirts of the earth seemed to have forgotten about her and father, and their Gilligan's Island-like comrades that make up The Bathtub. 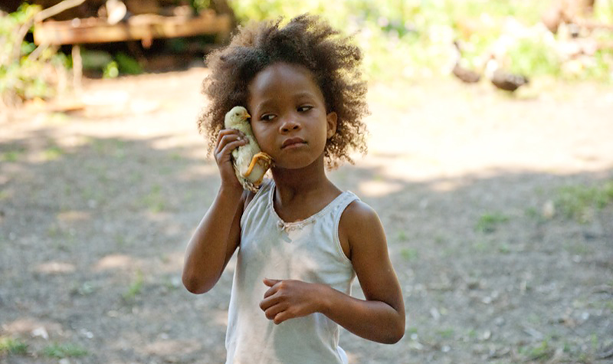 But Hushpuppy never really seems alone, or lonely. Rather, she appears capable and strong, and the glue which holds the Bathtub--and the entire movie--together. Her daddy, the warrior-like fisherman/unofficial mayor of The Bathtub, always taught her how to take care of herself--whether it was learning how to crack open a crab with her bare hands, or how not to cry during the tough times. Because, there are no helpless victims that live in The Bathtub; only heroes who'd do anything to protect their home. Standing knee-high, donning a dingy tee shirt, hand-me-down rain boots and often worn out boys' cargo pants, Hushpuppy was the biggest hero of The Bathtub. And she has her daddy thank for that. The audience gets to see life in The Bathtub told through the eyes of its diminutive starlet, which means a wondrous innocence and charm no adult could emit given the circumstances of the character. To others, The Bathtub is a wrecked piece of land, but to Hushpuppy it's a playground, an obstacle course that's not always easy to get through but is always well worth the lesson. The Bathtub becomes a watered down community Hushpuppy can only see as something to simultaneously conquer and tightly embrace. Her defiant words seep from her snarled mouth, Daddy says brave men don't run from their place. While Hushpuppy's valiance is astounding, the audience is let in on a fact the characters have quickly wiped away from their thoughts--the end of the world is nearing, and it's trying to take The Bathtub along with it. But you'd never know that the characters were even aware of this as they continue their days piecing the parts of their homes together that tried to swim away from them in the middle of the night. We know the end is near by the doomed fate of their fish; once their feisty dinner had become their willing prey. While all this is happening, Hushpuppy realizes the body of her once vibrant daddy may soon float into the water along with the other once living species of the land. It is her strength that keeps it together when literally everything and her everyone--her daddy, Wink--is falling apart around her. Exhibiting a candor and alertness that goes far beyond her age, Wallis has the tough task of being the emotional compass of a movie lifted by its neglect to show a grieving community. And she triumphantly rises to the occasion. In fact, you also most that the debut actress hand picked from her third grade class is now an adult with kids. Her ability to nurture not only her character, but the others in the story--along with The Bathtub itself--is, simply put, remarkable. But then Wallis reminds of her age as she narrates a smaller plotline, a mythical apocalypse of sorts in the guise of aurochs, swine-like creatures who've apparently come back to reclaim their soaked land at the end of its days. It's a somewhat fractured part of the story that really only makes sense because Hushpuppy tells us that it does. So we go with it. Watching a completely unknown cast of first-time actors, operating on a shoestring budget, the audience almost gets the impression that they're watching a documentary, rather than a fantastical story. We're so let into their lives that we just assume at any minute they'll leap out of the screen and invite us to a delicious catfish meal. But they never do. Alas, we just paid them a brief visit, one separated by our world and their reality. Inspired by co-writer Lucy Alibar's play "Juicy and Delicious," Beasts of the Southern Wild is touching, elegant, charming and at times ferocious. It will not only stir your soul, but also open your mind to the possibility of a real-life Promised Land. This review makes me look forward to the film. I'm totally looking forward to this film. It's totally down my line. The folkish feeling I get from the trailer reminds me of George Washington. Great review! I can't wait to see it. I had an opportunity to see it a few weeks ago, but missed the chance. Once it opens in Chicago, I'm there. I have been looking forward to this movie, and yourr eview has piqued my interest further. Beautiful. Really looking forward to checking this out. Hoping it does indeed open as planned this weekend. I've been excited to see this film ever since I saw the trailer! Glad you posted a rave review Candice! I've see A LOT of movies, but after just seeing this this past Saturday 'Beasts' is the BEST film I've seen thus far 2012! Fantastic review, Candice! I could not agree more. I absolutely loved 'Beasts of the Southern Wild' and Quvenzhane Wallis' powerhouse performance is nothing less than stellar and stunning. She absolutely blew me away.